We provide a client data platform for maintaining accurate entity, sales, asset, and territory data, and deliver it to Salesforce. We help you to capitalize on your investment in Salesforce and give you access to all of the data you need. SalesPage Enterprise enhances Salesforce with the best possible data. Our data management tools provide a single version of truth for entity (firm, office, rep, partnership, and team) and sales data, in addition to supporting territories, zones, and segmentation to the level of complexity that asset managers require. Our powerful integration tools make that data available to you in Salesforce. Activity and sales history provides valuable insights when targeting and connecting to your prospects, but keeping that data in the Salesforce cloud gets expensive. 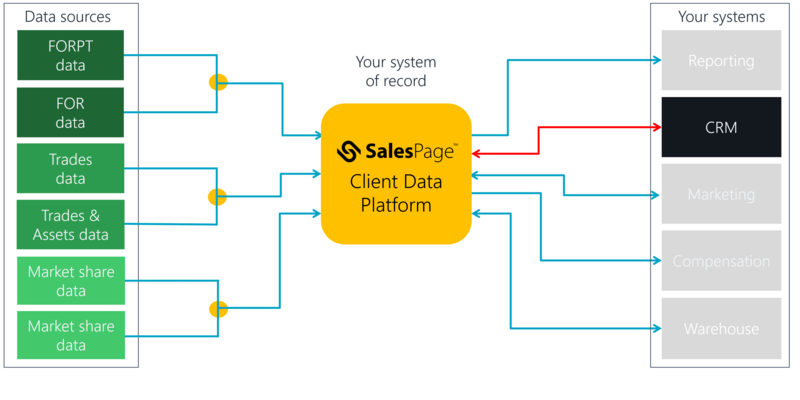 With this integration, the data stays in your warehouse and SalesPage makes the most important data available in Salesforce. Further data analysis is just a click away. Want to learn more about integrating with Salesforce?